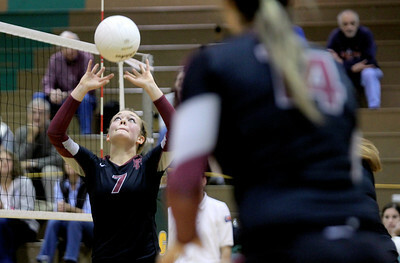 Prairie Ridge won Thursday's Regional volleyball tournament final against Crystal Lake South on October, 25, 2012. 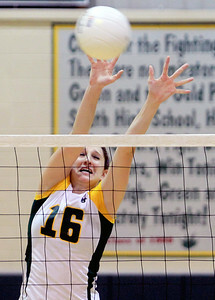 Sarah Nader - snader@shawmedia.com Prairie Ridge's Liz Dominski sets the ball during Thursday's Class 4A Crystal Lake South Regional volleyball tournament final against Crystal Lake South in Crystal Lake on Thursday, October 25, 2012. Prairie Ridge won, 2-1. Sarah Nader - snader@shawmedia.com The Crystal Lake South volleyball team celebrates a point during Thursday's Class 4A Crystal Lake South Regional volleyball tournament final against Prairie Ridge in Crystal Lake on Thursday, October 25, 2012. Prairie Ridge won, 2-1. 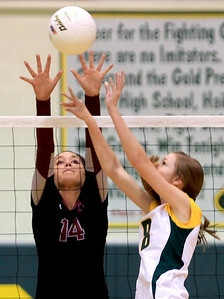 Sarah Nader - snader@shawmedia.com Prairie Ridge's Ali Witt (left) taps the ball over during Thursday's Crystal Lake South in the Class 4A Crystal Lake South Regional volleyball tournament final against Crystal Lake South in Crystal Lake on Thursday, October 25, 2012. Prairie Ridge won, 2-1. Sarah Nader - snader@shawmedia.com Prairie Ridge's Nikki Kirchberg (left) dives for the ball during Thursday's Class 4A Crystal Lake South Regional volleyball tournament final against Crystal Lake South in Crystal Lake on Thursday, October 25, 2012. Prairie Ridge won, 2-1. 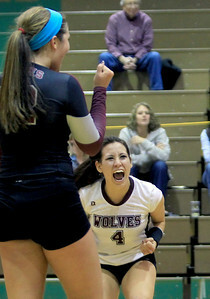 Sarah Nader - snader@shawmedia.com Prairie Ridge's Ali Witt (right) celebrates a point during Thursday's Crystal Lake South in the Class 4A Crystal Lake South Regional volleyball tournament final against Crystal Lake South in Crystal Lake on Thursday, October 25, 2012. Prairie Ridge won, 2-1. 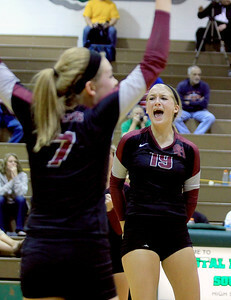 Sarah Nader - snader@shawmedia.com Prairie Ridge's Paige Dacanay (right) celebrates a point during Thursday's Class 4A Crystal Lake South Regional volleyball tournament final against Crystal Lake South in Crystal Lake on Thursday, October 25, 2012. Prairie Ridge won, 2-1. 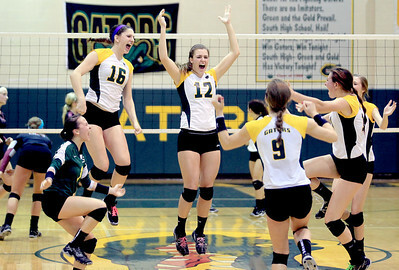 Sarah Nader - snader@shawmedia.com The Crystal Lake South volleyball team celebrates a game two win during Thursday's Class 4A Crystal Lake South Regional volleyball tournament final against Prairie Ridge in Crystal Lake on Thursday, October 25, 2012. Prairie Ridge won, 2-1. 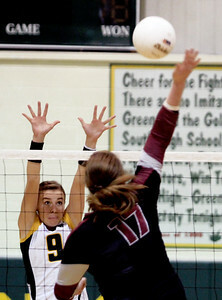 Sarah Nader - snader@shawmedia.com Crystal Lake South's Carly Nolan blocks the ball duringThursday's Class 4A Crystal Lake South Regional volleyball tournament final against Prairie Ridge in Crystal Lake on Thursday, October 25, 2012. Prairie Ridge won, 2-1. 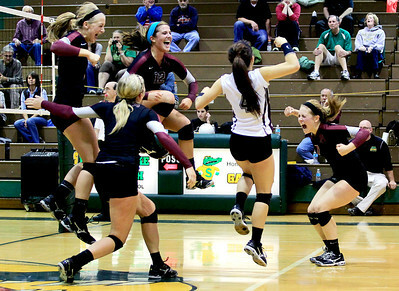 Sarah Nader - snader@shawmedia.com The Prairie Ridge volleyball team celebrates after beating Crystal Lake South in the Class 4A Crystal Lake South Regional volleyball tournament final in Crystal Lake on Thursday, October 25, 2012. Prairie Ridge won, 2-1. 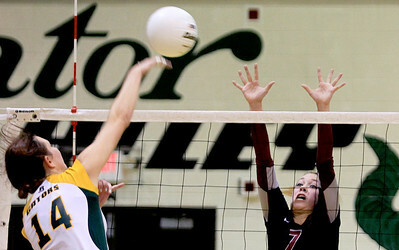 Sarah Nader - snader@shawmedia.com Prairie Ridge's Kennedy McNeil (left) jumps to block a shot by Crystal Lake South's Cassy Sivesind during Thursday's Class 4A Crystal Lake South Regional volleyball tournament final in Crystal Lake on October 25, 2012. Prairie Ridge won, 2-1. 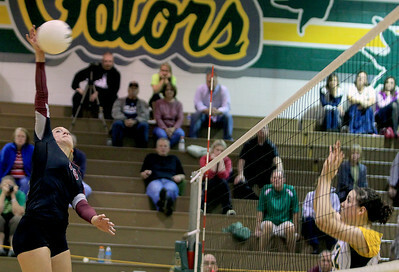 Sarah Nader - snader@shawmedia.com Crystal Lake South's Nicole Jurkash (left) jumps to block a shot hit by Prairie Ridge's Maddie Drain during Thursday's Class 4A Crystal Lake South Regional volleyball tournament final against in Crystal Lake on October 25, 2012. Prairie Ridge won, 2-1. 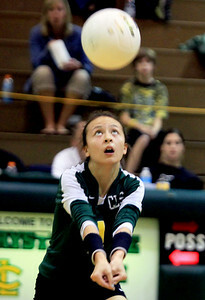 Sarah Nader - snader@shawmedia.com Crystal Lake South's Katie Meyers returns a serve during Thursday's Class 4A Crystal Lake South Regional volleyball tournament final against Prairie Ridge in Crystal Lake on October 25, 2012. Prairie Ridge won, 2-1. 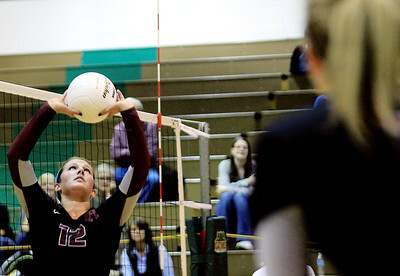 Sarah Nader - snader@shawmedia.com Prairie Ridge's Mackenzie Humm sets the ball during Thursday's Class 4A Crystal Lake South Regional volleyball tournament final against Crystal Lake South in Crystal Lake on October 25, 2012. Prairie Ridge won, 2-1. Sarah Nader - snader@shawmedia.com Prairie Ridge's Taylor Otto (right) jumps to block a shot by Crystal Lake South's Avalon Nero during Thursday's Class 4A Crystal Lake South Regional volleyball tournament final in Crystal Lake on October 25, 2012. Prairie Ridge won, 2-1.